Prominent British broadcaster Stephen Fry likened the new laws to the Nazis’ persecution of the Jews earlier this week, and on Thursday, Russia’s envoy to the United Nations was personally confronted on his New York doorstep by activists wielding a petition signed by more than 300,000 people. “The events unfolding in Russia should rightly cause concern for all fair-minded citizens of the world. They’re a complete travesty meant to divert the attention of the Russian people from President Putin’s failure as their leader,” said Human Rights Campaign Vice President for Communications Fred Sainz. 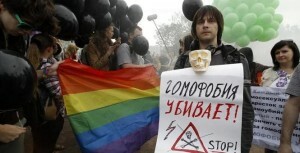 The GJI calls for an end to violence against LGBTQ people in Russia around the world. We call on fair minded people of faith to join efforts to speak against these acts of violence and murder and to stand in solidarity with those who are victimized. We call on members of the clergy to speak boldly for the divine value of every person. Finally, we join our prayers with those of people of faith for an end to the victimization of LGBTQ people in Russia and around the world. The GJI calls on people of good will around the globe to make your voice heard on behalf of the freedom and safety of LGBTI people in Russia by contacting the Russian Embassy or Consulate nearest you and demanding that the legislation criminalizing LGBTI life be rescinded. The Global Justice Institute, Rev. Pat Bumgardner, Executive Director.